A dangerous criminal dies in a shuttle fire, but when it appears that he is still working to acquire material from the Gamma Quadrant, the crew slowly realizes he may not be as dead as he seems. The whispering in the shadows thing when "Vantika" confronts Quark after hours is pretty cheesy. Ugh. "A humanoid only uses a small portion of the brain." This is widely believed, but it also happens to be pseudoscientific nonsense with no scientific backing whatsoever. 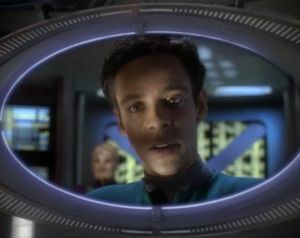 When Bashir is under the control of Vantika's consciousness, Alexander Siddig's acting is ludicrously over-the-top, like a terrible parody of Malcolm MacDowell. It's really bad. So it is established that Vantika is, much like Voldemort, motivated almost entirely by a desire to live forever. It is further established that he wants to get his hands on the deuridium shipment because his species, the Kobliad, are dying, but deuridium can prolong their lives. However, in order to get his hands on the deuridium, Vantika concocts a plan to insert his consciousness into another humanoid brain right before his body is killed off. In theory, he could live on with a new host body, jumping from body to body whenever the need arises. So why does he still need the deuridium? The writing in this episode is very good. It's a puzzle show that has a couple of nice twists and turns, and the focus on defining Odo's jurisdiction is a wise choice. I also like that it ends with Kajada vaporizing Vantika's isolated consciousness instead of keeping it in a box on her table like Barclay does with Moriarty at the end of "Ship in a Bottle"; it is more fitting for the overall tone of DS9. I also like that it plays with ideas previously seen in Star Trek (think of Star Trek III: The Search for Spock mixed with "The Schizoid Man"), but puts a unique spin on them. Alas, there are some poor directorial choices that derail what should be a good episode, and Alexander Siddig's ridiculous acting is impossible to take seriously. Bashir, as a character, is a jerk at this point. In retrospect, it's easy to blame this on his childhood genetic modifications and his struggle to come to terms with his own superiority complex.